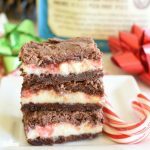 Raspberry Cheesecake Dessert has so many of my favorites layered in there! 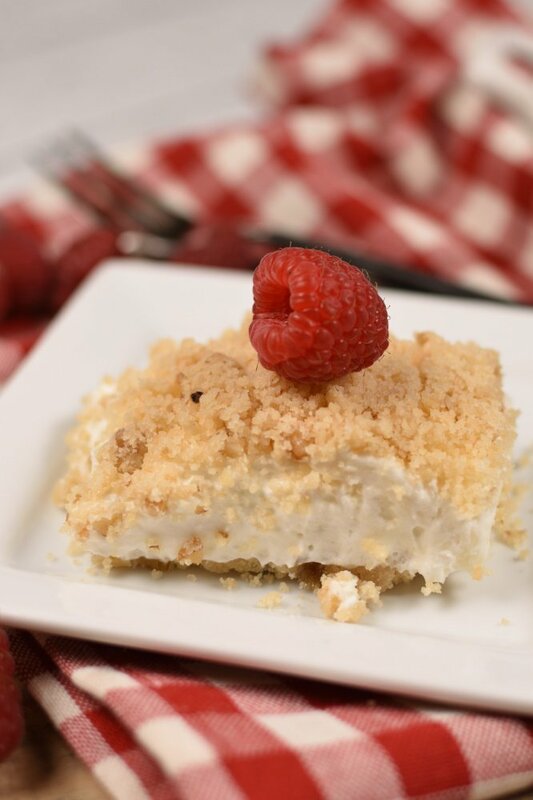 I can’t even begin to describe to you how amazing the shortbread crumb crust is on this dessert; it’s just right! 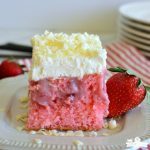 The cream cheese filling is light and fluffy and just the right amount of sweet! Top it all of with sweet raspberry sauce and prepare to swoon! Why haven’t I shared this Raspberry Cheesecake Dessert before now? A few weeks ago, after much debate, I decided to pull my youngest out of school and homeschool him. Agggghhhh! I homeschooled my middle child in fifth grade and so this time I felt like I had a better understanding of what I was getting myself into. I knew I had to say goodbye to my social life, cut way back on the amount of time I spend blogging, and pretty much commit myself to being a shut in for 16 full weeks! We consider the day successful if Payson only cries once and if I curse less than five times! Being the least patient person in the world doesn’t help one bit. All in all, things are going well. He’s has already learned WAY more than he learned the other 20 weeks when he was at school. He’s completed approximately 700,000 papers, or at least it feels like it, and he’s learned how to read numbers clear up in the trillions. It’s important and apparently they either don’t go over that at school or he was asleep when they did! Like I said, my blog is suffering just a bit. Okay a whole lot! I’m still creating millions of awesome super easy recipes in my head I just don’t have time to create them in real life and share them with you. Raspberry Cheesecake Dessert obviously makes and romantic Valentine’s Day dessert but it’s pretty much awesome any day of the week! 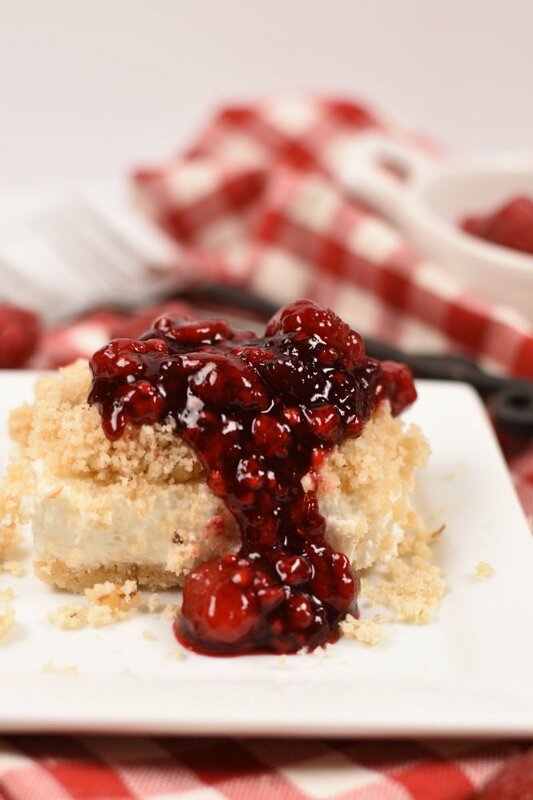 This Raspberry Cheesecake Dessert is the PERFECT Valentine’s Day dessert! I made it a few weeks ago with every intention of sharing it with you so you could make it for your loved ones. But, you know, I taught all about lovely and useful adverbs and descriptive and vivid adjectives instead. So now you know my excuse for completely disregarding Valentine’s Day this year…I hope you had a fantastic day filled with love, chocolate, and flowers and some amazing dessert you whipped up! And I’d like to suggest you make Raspberry Cheesecake Dessert any other day of the year because it will be every bit as tasty! Raspberry Cheesecake Dessert is one of those darn treats that makes you lean back in your chair and swoon. 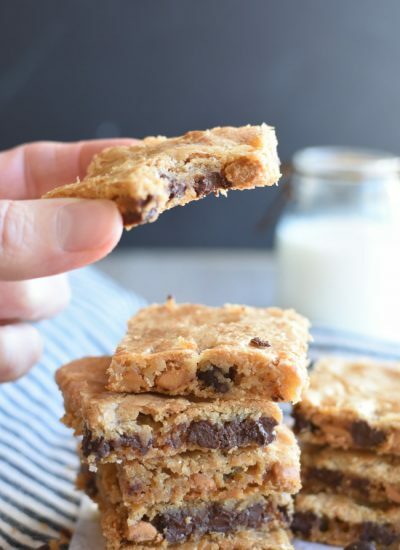 It’s that addicting dessert that you wholeheartedly promise yourself you will only have one piece and then continue eating one more bite, and then another, and another until you’ve eaten at least three dreamy pieces! My friend Evelyn brought this Raspberry Cheesecake Dessert to a Christmas party for the volunteer EMT’s in our area! I was hooked after the first bite! The buttery crust is unlike most of the other lush, Robert Redford, type crusts out there! It’s diving! 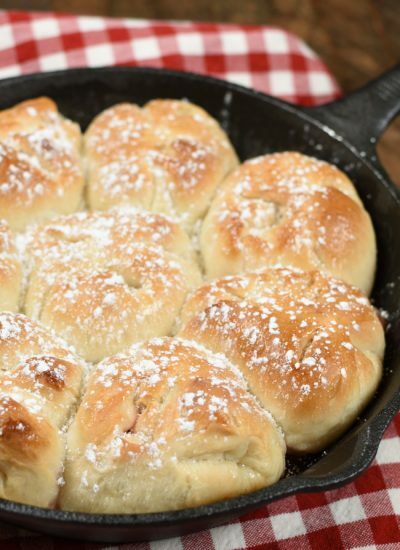 The filling is light, and fluffy, and just right! 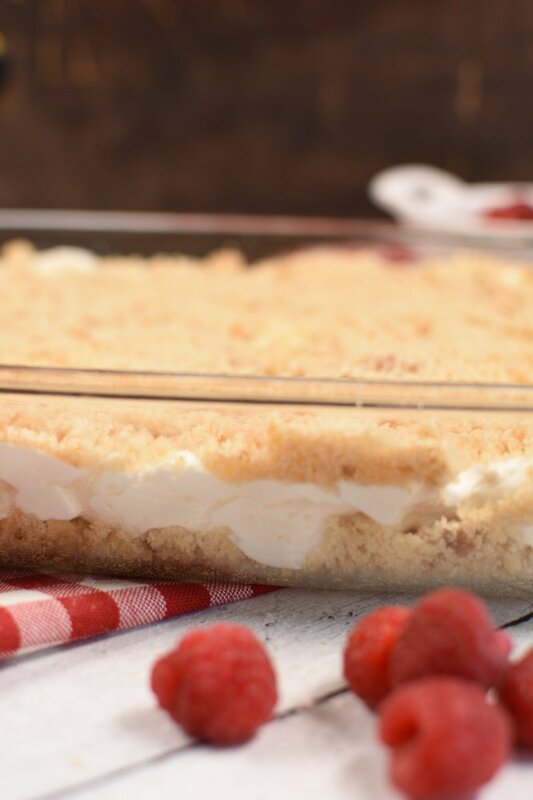 Then the raspberry topping…can we say I’m really hoping there’s some leftover after the Raspberry Cheesecake Dessert is gone because I kind of just want to eat it with a spoon! Anyway, I hope you had a fantastic Valentine’s Day! 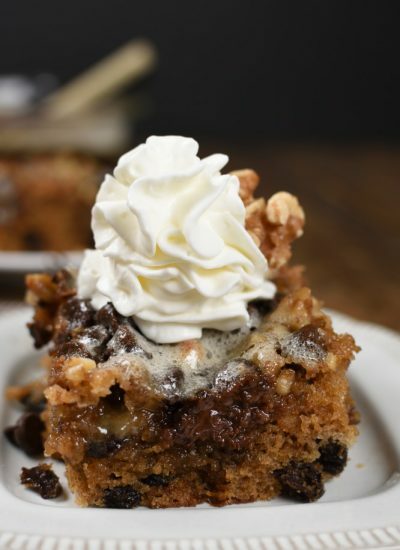 Be sure to add this to your spring and summer dessert list! It’s a winner no matter what day it is! 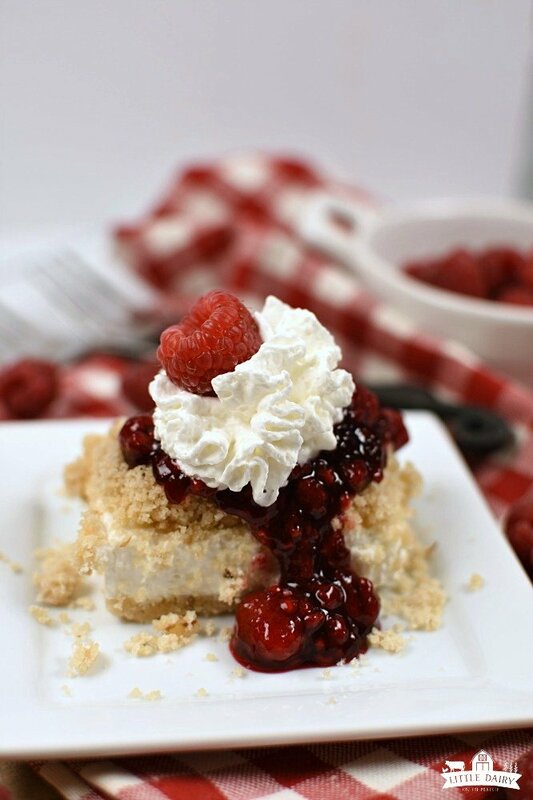 Raspberry Cheesecake Dessert printable recipe! Oh and be sure to sign up for my newsletter so you don’t miss any fun new recipes! I promise you won’t get any spam, just awesome recipes…not that I want to send spam to you, but I really don’t have time for that right now anyway! Raspberry Cheesecake Dessert has the most incredible buttery crust and a light and fluffy cheesecake filling that will make you swoon! Spoon a little raspberry or strawberry sauce on top and you'll think you are in heaven! Cream butter and brown sugar together. Add flour and walnuts. Mix. Spread in a greased 9 x 13 pan. Bake for 15 minutes. Remove from oven and let cool. Once cool crumble. Divide in half. Press half of the mixture in the bottom of the 9 x 13 pan. Reserve the other half for the top of the dessert. Beat whipping cream until stiff peaks are formed. Set aside. Mix cream cheese, powdered sugar, and vanilla until smooth. Fold whipped cream into cream cheese mixture. Spread over crust. Sprinkle reserved crumbs over cream cheese layer. Let rest in the refrigerator for 2 or more hours. To make the berry topping follow the instructions on Danish Dessert package for making a glaze. 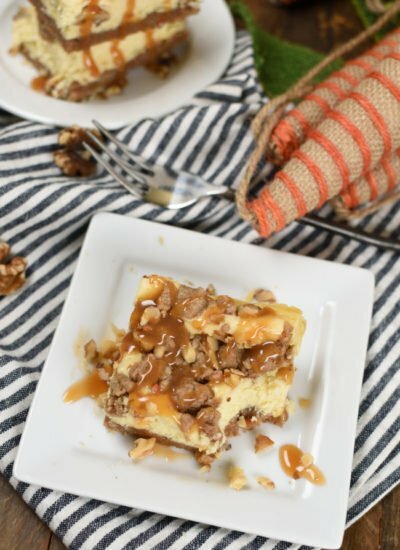 Cut dessert into squares and serve with prepared Danish Dessert spooned on top. 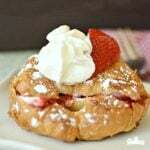 You can add a dollop of whipped cream if you’d like! That crust sounds soooo good. I love that you sprinkled some of it on the top too! Thanks! This crust isn’t your typical crumb crust and I absolutely adore it! I’m not going to lie, I had to sneak a few pieces while I was assembling the pie! It’s just so irresistable! Thanks Dee! 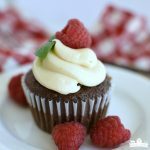 Easy desserts are at the top of my to do list almost every day! So yummy! And yes, homeschooling is challenging but it’s been fun to spend time with him. And it’s nice knowing he’s not wasting his day while his teacher take a nap, or whatever she was doing all day long! Eeek! Oh my, raspberry and cheesecake go together so well, and this looks phenomenal! It’s a dreamy combination isn’t it! Enjoy! Such a perfect dessert! Gotta make this! Thank you! It’s a favorite all year long! This all looks fantastic but that raspberry topping has me swooning! Yes! I could eat it with a spoon! But it is pretty yummy on top of this dessert so I had to contain myself just a little bit! Loving all the layers to this! Looks like a delicious treat! My too! I can’t decide which is my favorite! They all come together so perfectly! Enjoy! My oldest son LOVES cheesecake so I know he’s going to devour this! Oldest sons have a way of devouring EVERYTHING! At least mine does! This really hits the spot! What a gorgeous dessert! This will be a sure hit in my house! It’s such and easy and fun one! Enjoy!